이창석, 허창대, 고혜영, 한상환,(2018).이축 휨을 받는 겹침이음된 기존 RC 기둥의 이력거동.콘크리트학회 논문집,30(5),473-480. 지진하중을 고려하지 않고 지어진 철근콘크리트(RC) 기둥의 경우, 일반적으로 겹침이음은 일반적으로 길이가 짧고, 구속이 충분히 되어있지 않으며 모멘트가 집중되는 기둥 단부에 문제점이 존재한다. 겹침이음된 RC 기둥의 내진성능평가는 주로 축력과 일방항 하중하에서 수행되었다. 본 연구에서는 이방향 하중이 부적절한 겹침이음 상세를 가진 기존 RC 기둥의 내진성능에 미치는 영향을 조사하기 위해 2개의 실험체를 제작하여 일방향, 이방향 가력 실험을 각각 수행하였다. 실험결과를 통해 이 방향 하중이 부적절한 겹침이음 상세를 가진 RC 기둥의 이력거동에 상당한 영향을 미치는 것을 확인하였다. A common deficiency in existing reinforced concrete (RC) columns built without considering seismic load is that the lap splices are often short, poorly confined, and located at the end region of columns. 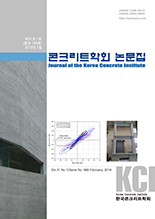 Assessment of seismic capacity of RC columns with lap splices have mostly been based on experimental tests under axial load and uniaxial bending. To investigate the effect of biaxial bending on the seismic performance of existing RC columns with deficient lap splices, two full-scale specimens were fabricated and tested under uniaxial or biaxial loading. Experimental findings revealed that biaxial loading had significant effects on the hysteretic behavior of RC columns with deficient lap splices.